A dramatic election in the North has strongly boosted the nationalist parties but appears set to ‘decapitate’ the leadership of unionism. DUP leader Peter Robinson’s political career hangs in the balance and Reg Empey is said to be ready to quit as Ulster Unionist leader after a dramatic night and day of counting. 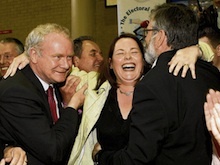 The most sensational results were Naomi Long’s shock win against Peter Robinson in east Belfast and Michelle Gildernew’s last gasp recount victory by four votes in Fermanagh/South Tyrone. Unionists in East Belfast had been expected to protest at the ‘Swish Family Robinson’ lifestyle and the ‘lust and greed’ scandal over Mr Robinson’s wife Iris which dominated the media earlier this year. However, it had been widely believed that their votes would disperse to three rivals. Instead, Long was singled out, apparently rewarded by the overwhelmingly Protestant electorate for her hard work and honest approach to her political work. Ms Long, the Belfast Lord Mayor and an Assembly member for East Belfast, quadrupled her vote since 2005. She wiped out Mr Robinson’s 6,000 majority, polling 12,839 votes and winning the seat with a majority of 1,533. Mr Robinson congratulated the Alliance Party, and said he remained committed to his job as First Minister and as an Assembly member until next year’s election. “I have a job to complete with my mandate at the Assembly, and I will continue to carry out that important work,” he said. Hardline unionists jeered Mr Robinson left the count. The following day, after a long night of counting and confusion, a victorious Michelle Gildernew held up four fingers to indicate the number of votes securing her eventual success in Fermanagh-South Tyrone. Four was also the number of counts required to separate her from her unionist opponent. Sinn Fein President Gerry Adams,and Deputy First Minister Martin McGuinness shared the jubilation in the unexpected victory which will have strongly vindicated the party’s electoral strategy in the North. The result, declared shortly before 3pm after the third recount, was 21,304 votes for Ms Gildernew and 21,300 for Mr Connor. “The forces of unionism had collected together against us and we had a mountain to climb this time,” Ms Gildernew said. She thanked traditional SDLP voters who switched their allegiance but said “Catholic, Protestant and dissenter” had voted for her. She said she was “especially proud and grateful” that “Protestant people . . . came out and voted for me”. The SDLP failed to make an impact, with former UTV journalist Fearghal McKinney polling 3,574 votes in the constituency, where the party had secured 7,230 votes in 2005. Sinn Fein had urged the SDLP to agree a nationalist unity candidate, after Alex Maskey withdrew from South Belfast. It criticised the SDLP for encouraging Mr McKinney, a political novice, to run as a reviled ‘splitter’ candidate in arguably the most challenging electoral arena in Ireland. Despite anecodotal accounts early on Thursday, the turnout of voters across the North was down substantially, with more than one voter in ten staying away. The number of spoiled votes also doubled in some areas in an apparent protest at the political system. But across the North, Sinn Fein managed its resources well and succeeded in extending its vote share to become the largest party in the North. The party has 25.5 percent share of the vote in the Six Counties, versus 25 percent for the DUP. If the result were duplicated in an Assembly election, due next year, Sinn Fein would have the right to elect the First Minister - a result which would be hugely controversial to unionist hardliners. Remarkably, all of the party’s MPs increased their vote share. In North Belfast, Sinn Fein’s Gerry Kelly put down a marker to Nigel Dodds for the next election in the constituency, by increasing his vote share by 7% and placing himself within a hop and a skip of the seat next time out. There was also progress for the party in South Antrim, East Antrim and Upper Bann. In South Down, the SDLP’s Margaret Ritchie benefited from tactical voting to keep out a determined challenge from Caitriona Ruane. Unsurprisingly, the DUP made no mention of its demotion to second-place status behind Sinn Fein. In his victory speech in North Antrim, Ian Paisley Jr apologised for “arrogance” on his and his supporters’ part, insisting this was only the natural self-confidence of having the help of “such a great God”. This was not a reference to his father, although he also heaped praise on Paisley Sr, from whom he received the mantle - and the Westminster seat. The DUP laughed off Allister’s defiance. But the Paisleyite celebrations were marred by the shock news from East Belfast, just then filtering through. And, with Sinn Fein set to outpoll the DUP next year, there will be more hard thinking for unionism ahead of next year’s Assembly elections. Already there have been declarations that the DUP should consider take the distressed Ulster Unionists under their wing to try to maintain unionist dominance in the Assembly. But Sinn Fein’s Deputy First Minister Martin McGuinness held out an olive branch, and said he would continue to work with First Minister Peter Robinson despite his loss in the election. Mr Robinson’s loss was a “shock to us all”, but the people had spoken, he said. The people had also charged Mr Robinson to continue in the Executive, and he said he would remain in government alongside him.